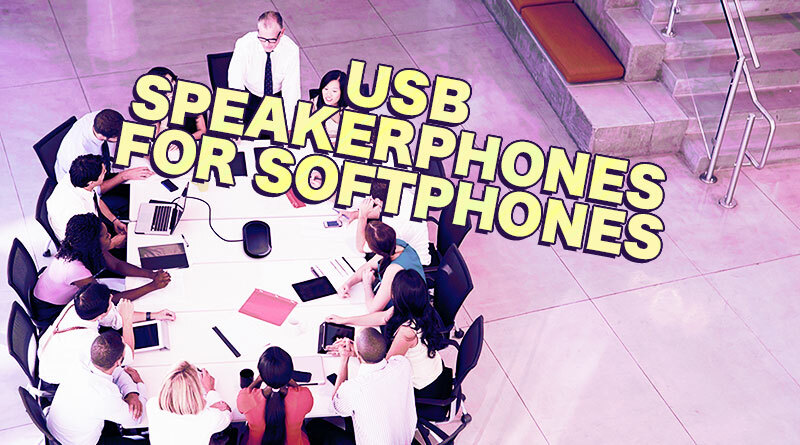 A USB speakerphone provides a plug-and-play solution for giving your softphone professional audio quality. A softphone is a software telephone application. Instead of using a separate phone or conference phone, you control calls on your computer. 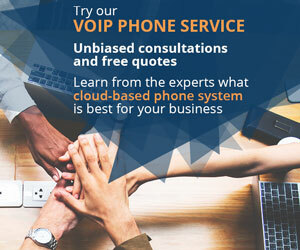 A softphone can be the interface for an on-premise VoIP phone system or a cloud-based hosted VoIP service. It might also be part of a unified communications system. Most softphone platforms also have mobile apps to let you carry your business extension with you anywhere. Many businesses are choosing to use a softphone instead of or in addition to the traditional phone experience. There are many reasons for this shift. Younger workers are more familiar with computers or smartphones than with deskphones. Softphones can reduce infrastructure costs, since you don’t need to buy separate devices. When part of a unified communications system, they allow for quick escalation to video conferencing when necessary. And these are just some of the reasons. But there is one major drawback: sound quality. If you’ve ever tried to use your PC’s or laptop’s built-in microphone and speakers, you know how bad the sound can be. In a previous blog, we covered headsets for softphones. Headsets, however, only work for one person at a time. What if you want to have a conference call using your softphone? USB speakerphones provide the simplest method on the market for giving your softphone the professional audio quality expected of a business phone system. What are the advantages of USB speakerphones? Audio Quality. Speakerphones offer a vast improvement in audio quality on conference calls compared to what you get from computers or smartphones. Simplicity. USB speakerphones are plug-and-play solutions. Interoperability. You don’t need to worry about software drivers and communications protocols with USB devices. Portability. Many USB speakerphones are easily moved or taken on trips, so you’ll always have professional audio with you. No Power Cord. Most USB speakerphones are powered via the USB cable, reducing clutter. So what USB speakerphones do we recommend? Jabra Speak 710 is a portable speakerphone that provides immersive sound. Small and lightweight, Speak 710 is designed to be used in huddle rooms, impromptu spaces, or as a music speaker. You can connect via USB or Bluetooth. Speak 710 has an omnidirectional microphone with 360° pickup for up to 6 people. If you want stereo sound or increased coverage for larger meetings, you can pair two Speak 710s wirelessly. The speaker has an integrated USB cable that wraps around the speaker for an elegant storage solution. It also comes with a Jabra Link 370 USB Dongle, which plugs into a computer, giving you wireless connectivity using Bluetooth Low Energy. It’s compatible with Skype for Business, Cisco, Avaya, and a host of other softphone platforms. It even has a Smart button that lets you interact with a digital assistant like Siri or Cortana. 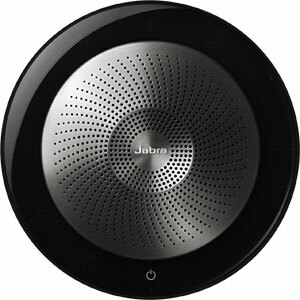 Jabra Speak 810 is a professional speakerphone for larger conference rooms. You can connect in one of three ways: USB, Bluetooth, and 3.5mm. Speak 810 works right out of the box. It’s a true plug-and-play device with capacitive buttons for call control. 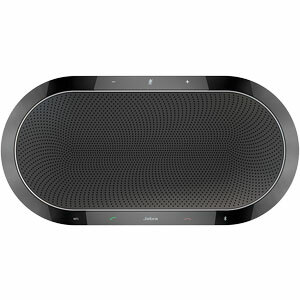 A sleek black lozenge with a stylish grille, the speakerphone is intended for stationary use on a conference table. You can plug a laptop into it using USB. Or you can wirelessly connect a smartphone or tablet using Bluetooth with a range of up to almost 100ft. If you’d prefer, you could also connect a smartphone or tablet using the 3.5mm jack. The USB port supports charge out, so you can charge your phone while on a conference call. Speak 810 features ZoomTalk microphones. These directional microphones focus on up to 15 human voices using built-in intelligence. It uses digital signal processing to provide crystal-clear HD audio, even when the volume is all the way up. Speak 810 seamlessly integrates with the leading softphones, including Skype for Business, Cisco, and Avaya. 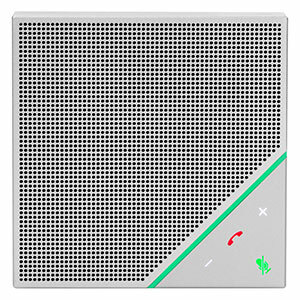 Polycom VoxBox is a portable speakerphone that gives you two easy options for connecting: USB and Bluetooth. VoxBox is extremely compact, measuring less than 4.5” across, making it easy for you to move it or take it on a trip. It might be small, but VoxBox still provides Polycom’s legendary HD Voice, the standard-setting audio quality. 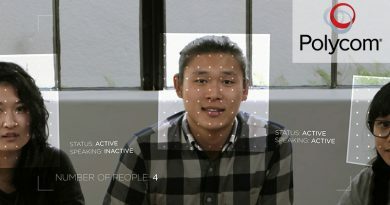 Polycom NoiseBlock gets rid of non-speech background noise, clarifying your calls. It automatically mutes the microphones when you stop speaking, greatly reducing the amount of disturbance in the conversation. 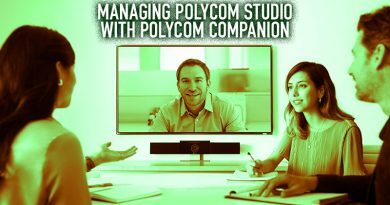 Polycom Acoustic Clarity normalizes voices for even sound quality, reduces background noise, and intelligent steers the microphones for optimal pickup. 4 directional microphones provide 360° voice pickup out to 10ft, making it ideal for the huddle room. And everyone will be able to hear the conversation. 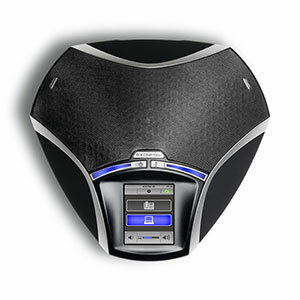 Its speaker has a maximum volume of 83dB at 0.5m with low distortion. As a Bluetooth speaker, VoxBox can be paired with 10 devices at one time. VoxBox has a rugged cast aluminum case and is IP64 rated against dust and water, so you’ll be able to get professional audio no matter where you are. The battery lasts for over six hours on a single charge. If you intend to use VoxBox in a public location, it ships with a USB security cable to prevent theft. 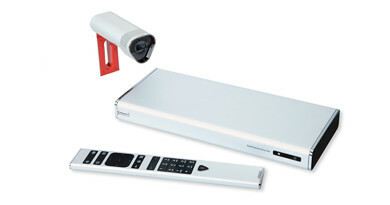 Konftel 55 is more than a USB speakerphone: it’s a full conference station. Konftel 55 acts as a communications hub, because it can connect to computers, mobile devices, and deskphones (with an adapter). You can switch or combine connections using the touchscreen. Konftel OmniSound technology gives you HD audio for full-duplex conversations that are clarified by automatic echo cancellation and noise suppression. The microphone picks up audio in 360° for up to 12 people. It can act as a line bridge from USB to cell, USB to deskphone (with adapter), or cell to deskphone. It also has an RJ11 port for cable connection to a compatible cell phone. You can attach a headset using the 3.5mm jack. Konftel 55 lets you record your conferences to an SD card without requiring additional licensing. 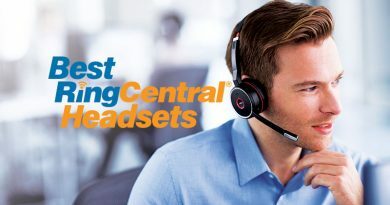 It connects with Skype for Business, Cisco Jabber, and Avaya Communicator, providing call control right on the speakerphone itself. For more USB speakerphones, visit IP Phone Warehouse!